List of Medical Colleges In Bihar Total Govt. 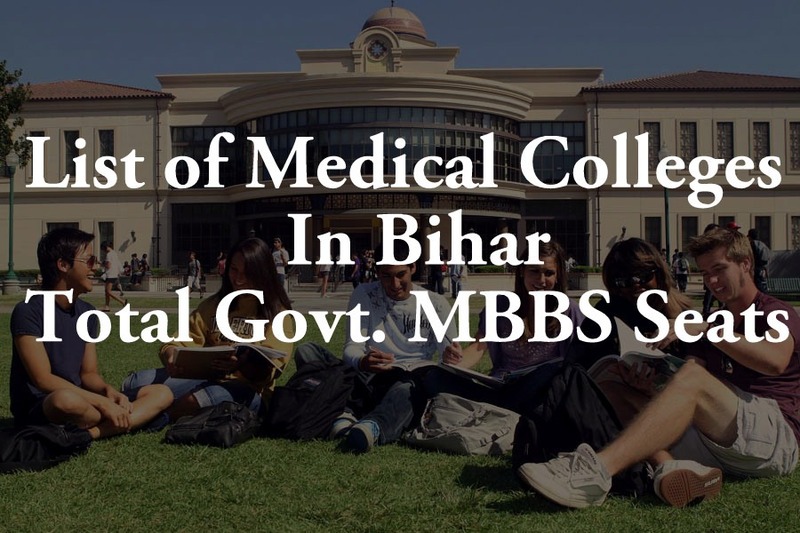 Private MBBS BDS Seats: In this article, We have shortlisted all medical colleges in Bihar state along with total MBBS & BDS seats. This year, all MBBS and BDS seats will be filled through the National Eligibility Entrance Test (NEET) 2018. The NEET 2018 is National level exam conducted every year at various examination centers across India. All candidates who had appeared in this exam will be able to get admission in Bihar’s medical colleges through NEET 2018 Counselling. CBSE Will soon announce the NEET 2018 result and scorecard. Indira Gandhi Institute of Medical Sciences, Sheikhpura Patna Indira Gandhi Instt of Med. Sc., Patna (Deemed Univ.) Govt. 2011 100 Permitted for renewal of permission u/s 10(A) for 2012-13. Katihar Medical College, Katihar B.N. Mandal University Trust 1987 100 Recognized for 60 seats.Permitted for increase of seats from 60 to 100 u/s 10(A) for 2012-13. Lord Buddha Koshi Medical College and Hospital, Saharsa B.N. Mandal University Trust 2012 100 Permitted Permitted u/s 10(A) for 2012-13. Bihar Trust 2008 100 Permitted for renewal of permission for the year 2012-2013. Sir,i got 207marks in neet 2017in obc category,can I get any mbbs college in Bihar?